December and the first weeks of January are, indeed, pretty free of obligation, fishing wise. The boat has been winterized, we’ve had our celebrations, taxes aren’t due for a spell and the winter roll of meetings has yet to begin. but primarily there is constant work to be done maintaining a steel boat that spends its life in salt water. Jim has referred to the boat as a ‘machine shop on the salt water,’ with great strain put on the engine and hydraulic systems during the fishing season and then left to fend off the vicissitudes of salt water upon steel all winter long. There are three engines powering the Marshal Tito operation; the main engine, a 871 ‘Jimmy’ diesel, an auxiliary diesel engine, used to power the refrigeration system and a Jimmy 671 diesel in the skiff. 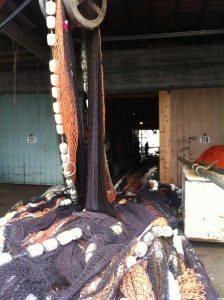 The skiff is used to control the end of the 1/3 mile long net, and requires a lot of power for that purpose. 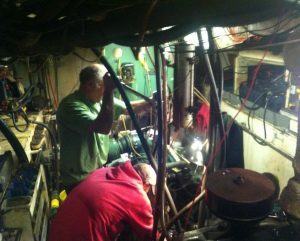 Jim thought it was smooth sailing until three weeks ago, just a month before he intended to leave for Alaska, when it was discovered that the main engine had to be rebuilt. Such jobs, usually relegated to the winter months when there is plenty of time, are huge and very expensive, costing over $50,000. Global competition for steel has made anything made of steel very expensive. It is striking how quickly and dramatically these global market forces have come into play. 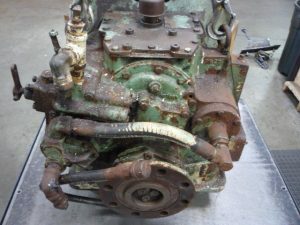 In addition to rebuilding the main engine, the gear, a 509 Twin disc transmission, was pulled out of the engine room for rebuilding. This earnest machine has worked hard and unerringly for over 30 years, and has, in my opinion, almost a personality (think Mike Mulligan and His Steam Shovel). Here is a picture of this hardworking servant after 30 long years translating the power of the main engine to the propeller that moves the boat. It almost deserves and bouquet of flowers and a gold watch, instead what it got was a $13,000 spa treatment at Mill-Log, an Oregon based business dedicated to the repair of Twin Disc transmissions. If only we could all experience this degree of transformation after a $13,000 visit to machine shop! The Marshal Tito, helpless, has been tied to the dock during this time that the engine has been at the shop. 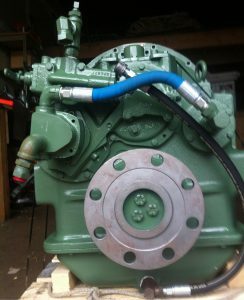 When the engine is installed, it is time for the boat yard in Port Townsend where the hull will be inspected and painted. Port Townsend is worthy of whole story all its own. Stay tuned. 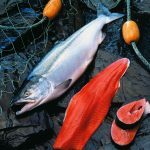 Next Next post: Canned Wild Alaska Salmon + Avocados; A Marriage Made in Food Heaven.